Düsseldorf (ukd/dre). As an expert in rare metabolic diseases, he cares for patients from all over Germany at the University Hospital Düsseldorf (UKD). However, his volunteer work for patients suffering from rare diseases goes far beyond that: at the end of January, UKD physician Prof. Dr. med. 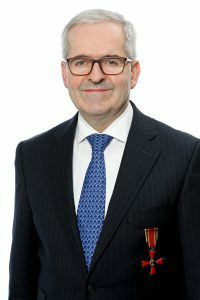 Stephan vom Dahl received the Cross of Merit on the ribbon of the Order of Merit of the Federal Republic of Germany. Prof. Dr. Stephan vom Dahl works as a senior physician at the Department of Gastroenterology, Hepatology and Infectiology of the UKD (clinic director: Prof. Dr. Dieter Häussinger). More than 450 patients are taken care of each year at the Clinic for Rare Metabolic Diseases in Adults. The outpatient department was one of the first of its kind in Germany. „Our work for these patients is also an important pillar of the Centre for Rare Diseases at the UKD.“ In this clinic-wide centre, experts from different disciplines work closely together, for example, from Department of Human Genetics or the Children’s Clinic of the UKD. For Prof. vom Dahl, close and often long-term cooperation with patients and their relatives is important: „Of course, it can take a long time to find a solution to a complex problem. But if you have found this solution and the therapy works: This is an enormous and rapid improvement for the lives of patients and their relatives.“ In the light of these facts, Prof. Dahl volunteers in numerous patient associations, such as the Gaucher Society Germany , the Hemochromatosis Association Germany e. V. (HVD) and the Liver League e.V. based in Düsseldorf.“ He is also editor of the scientific book „Inborn Errors of Metabolism in Adults“. Informationen zur Ambulanz für angeborene Stoffwechselkrankheiten bei Erwachsenen am UKD gibt es hier. Adults with inborn errors of metabolism continue to have no legal claim to specialist medical care – § 116 b paragraph 2 of SGB V remains unchanged. The ASIM will continue to remain politically active in order to repeal this unfounded and absurd restriction in §116. SGB V § 116b addresses the outpatient health care by medically specialized consultants. In conjunction with other registered medical associations such as the APS, the ASIM claims a modification of this paragraph. Inborn errors of metabolism do subsist for a lifetime. Especially to adults suffering from these diseases no adequate medical treatment is rendered in Germany. The limitation to children needs to be abolished in this paragraph!